Angela Di Michele Lalor is a senior consultant at Learner-Centered Initiatives (LCI), where her work includes facilitating schoolwide initiatives in the areas of curriculum, instruction, and assessment. Her primary focus has been helping districts design high-quality units of study that incorporate meaningful and engaging learning experiences for students. In addition, she has worked with teachers to design quality assessments; link curriculum, assessment, and grading and reporting practices; differentiate instruction to meet the needs of all learners; and examine student work to move student learning forward. Lalor began her career as a 7th grade social studies teacher. She is a certified Fellow at Communities for Learning: Leading Lasting Change. Additional information about Angela and her work is available on the LCI website. 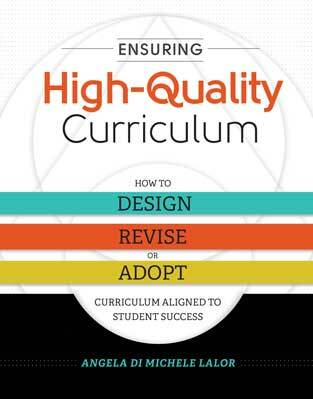 Develop a solid foundation for teaching and learning with this definitive, step-by-step guide to curriculum design and evaluation.